In China’s southern Guangxi province, Yangshuo sits between karst peaks near the confluence of the Li and Yulong Rivers. From top to bottom, West Street (西街) is lined with handicraft gift shops and laid back eateries and bars. Be sure to haggle with local vendors and don’t be too surprised if local Chinese, including seniors, have some command of English. Yangshuo has become a go-to spot for backpackers, party-goers, sightseers, and climbers but only a short distance outside the township, Yangshuo County remains rural and idyllic. Here are five reasons why despite growing crowds Yangshuo remains China’s ultimate backpacker retreat. 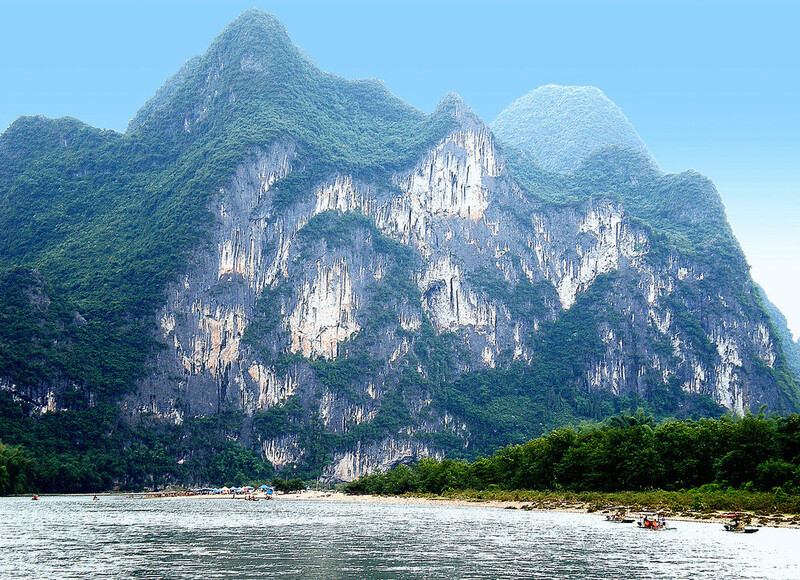 With its thousands of karst peaks, Guilin has world class crags and climbing routes. The first local peaks were pioneered by German climbers in the mid-1980s. Then routes were opened up by American and Chinese climbers in the early 1990s. Now there are over 800 sport climbing routes. Guilin’s popularity is based upon the many and varied routes, the quality of the rock, the accessibility of the peaks and its low cost. Rent equipment at one of the many downtown climbing clubs. Popular local routes include the aptly named Swiss Cheese, a pockmarked karst cliff excellent for lower to intermediate climbers with its thirteen different routes varying from 10 to 35 meters in height, plus another eight routes on another face. With flat winding country paths along rivers and ancient villages, cycling is by far the best way to explore the region, especially Yangshuo and the Li and Yulong river valleys. Bicycle hire is near ubiquitous in Yangshuo. Most Yangshuo guesthouses offer bike rental service of some description. At the low end expect to pay around RMB20 for a rusty roadster, whereas RMB120 at the other end of the scale will get you a serious mountain bike. With thousands of limestone peaks in Yangshuo, there are abundant hikes up the karst hills, as well as countryside trails that take in rural life of the Yulong Valley. There are many established parks with pagodas or pavilions adorning the peak, as well as some untouched summits to scale. It is possible to engage a local guide to help navigate the fields and peaks of Yangshuo and price is negotiable. All trails are not necessarily clearly marked and the assistance of a local guide can assist in finding the right path. Yangshuo’s karst topography not only extends to the spectacular pinnacles above ground, but also under the surface of the earth. Below ground Yangshuo also has a vast array of sinkholes, dolines (a depression, where the surface crust has collapsed), underground streams and rivers; as well as caves (the most in Guangxi). Yangshuo has an abundance of caves riddling the limestone mountains and the more thrill-seeking spelunkeans pursuing an adventure sports experience should seek the assistance of one of the rock climbing clubs. Some caves are unregulated and you need to take responsibility for your own safety and avail yourself of an experienced guide. The most popular of these caves are the Buddha Cave and the Longmen Water Cave. Whether you wish to go darting up and down the Li River in a faux bamboo plastic speedboat, or take a bamboo raft up and down the dykes of the Yulong, or perhaps go white-water rafting north of Xingping, options abound. 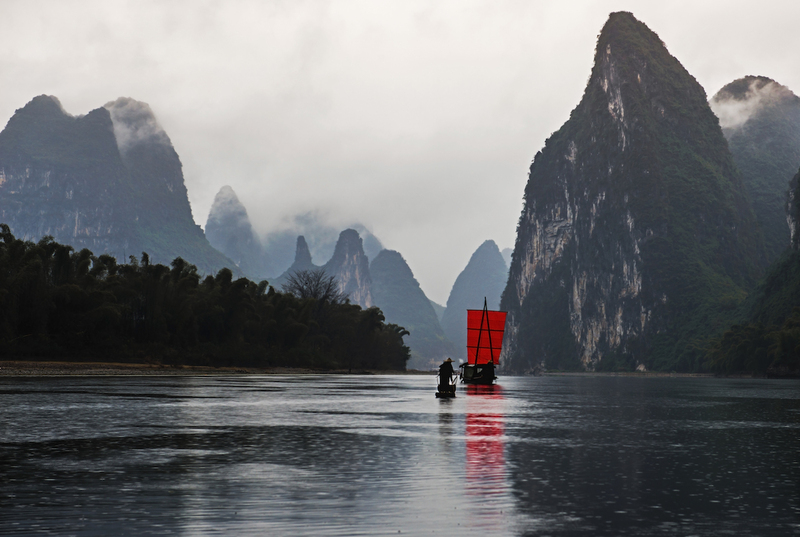 It’s popular to rent real chauffeured bamboo raft-punts on the Yulong River. These either take you on a lap of a section of the Yulong or for the more intrepid, they can take you across one of the dykes for a splash. Days out tubing on the river can be arranged at Monkey Jane’s guest house on West Beach, or tubes can be hired on the Secret Beach, 1km west of Yangshuo Wharf. 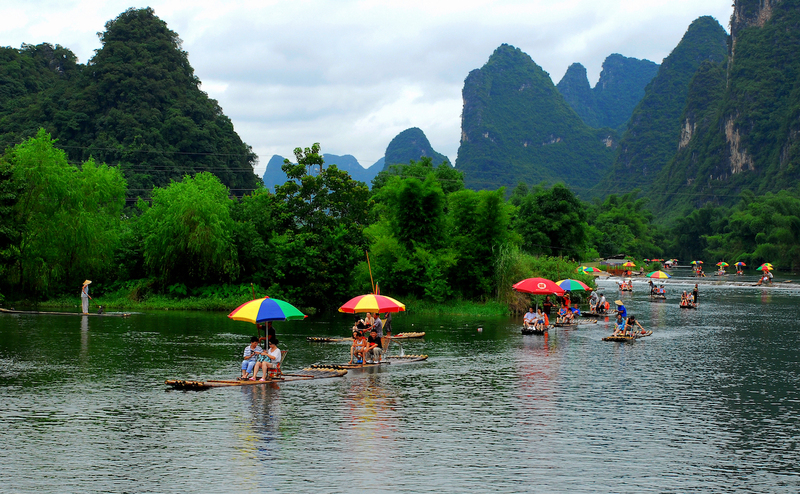 Most visitors to Yangshuo will arrive first in the provincial capital of Guilin. The Guilin scenic area is served by Guilin Liangjiang International Airport, a two-hour drive from Yangshuo. More than 60 international airlines connect Guilin with 30 international cities, including Hong Kong and Singapore. High speed rail is also an excellent way to arrive in Guilin, with several daily services from Guangzhou and Shenzhen. Courtyard hotel in the Yanshuo countryside on the road to Fuli, which under the tutelage of its idealistic owner Simon is far more than a guesthouse but a centre for international exchange where guests can learn about Chinese culture, language, and cooking. Prestigious French run hotel and restaurant in central West Street, offering French classics suchas Escargots a la Francaise (RMB50), while other specialties include stewed chicken (RMB45). The restaurant also hits the spot with its bacon and eggs breakfast.